2018 seems to be the year for long awaited sequels. With the release of Incredibles 2 earlier this summer and the recent release of Mamma Mia! Here We Go Again, 2018 has a had some pretty spectacular summer movies. Mamma Mia! 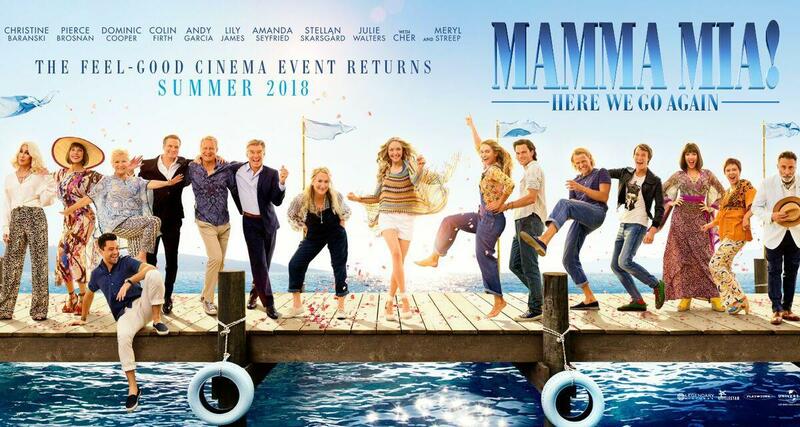 Here We Go Again is the long-awaited sequel to the beloved 2008 musical romance Mamma Mia! This film takes place about five years after the original; Sophie is all grown up and back on the little island, Kalokairi. She is in the middle of preparing the hotel for a grand re-opening, bringing everyone back together. Unlike the first movie, this one jumps around using flashbacks to show us how Donna’s story. For the first time, the audience gets to see just how Donna’s whirlwind romances played out all those years ago. As she learns more and more about her mother’s past, Sophie begins to feel closer to her than ever. This feeling is heightened further when she finds out that she is pregnant in the same place that her mother was so many years ago! Overall, this movie captured the comedic musical style of the first very well. Many of the songs are new renditions of songs from the previous movie which is charming. There are also many new songs to love on the soundtrack! The sequel has quite a few more comedic moments than the first and had the whole audience laughing. Mamma Mia! Here We Go Again is the perfect blend of romance, comedy, and just a pinch of heartbreak that keeps the audience entertained throughout. While some important details in the first film are missing in this sequel, it is definitely worth seeing! With catchy musical numbers, comedy, romance, and a beautiful setting like Greece, it is hard not to fall in love with this sequel. I found this movie (and the first one) to be the perfect movie to go see for a mother-daughter pair, group of musical loving friends, or even a family movie night!